I have been waiting and waiting and waiting to do Christmas posts for an ENTIRE YEAR! And I know Halloween is barely over but I just can't wait any longer. I have an inspiration board full of envelopes, receipts, and grocery lists full of ideas that would come to me and I would scribble them down before I forgot them. Now I get to put them into fun posts over the next few months. 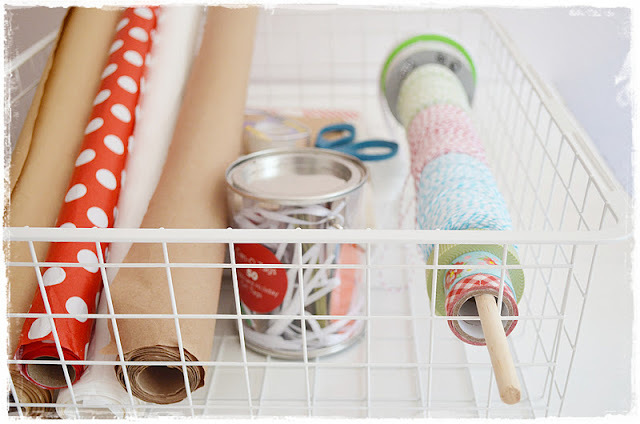 So what better way to kick off my Christmasy stuff then a post about getting organized with all our pretty holiday wrapping supplies? I, for one, feel absolutely ready to conquer ANYTHING when I get organized. So I came up 3 ideas using what I have around the house and I am so excited to share them with you wonderful friends! I found this cutie at a yard sale. This fun find was needing some major TLC. I bought him for $5 bucks and after some sanding, a fresh coat of spray paint with a kind of undefinable color that I totally adore (called Catalina Mist) it's got a fresher look! I even wrapped the handle with some thick, comfy yarn (until I can make a fabric handle) for more simple character. I love how roomy it is for all my wrapping paper and supplies. I thought another great find would be one of those small vintage wire grocery carts for storage. That would be cuuuuute! I rigged a little dowel rod for twine and ribbon in the middle. 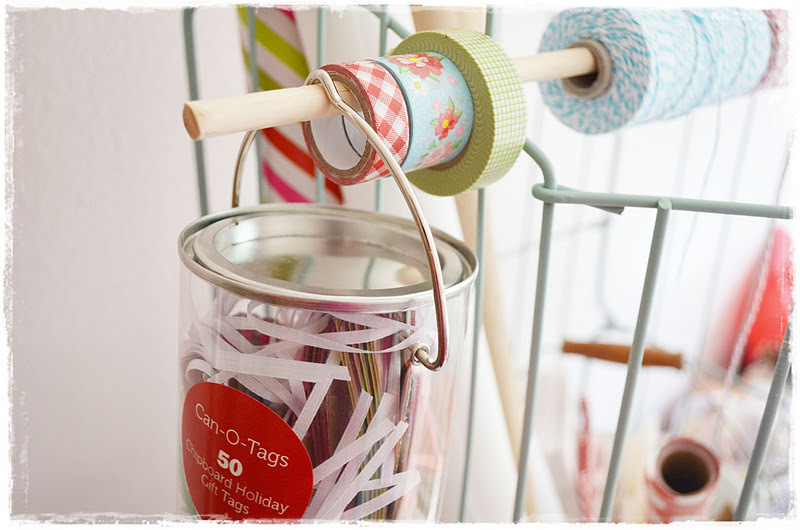 ...the other side has some washi tape and a little bucket full of tags. The white bucket holds tissue paper, bags and other wrapping supplies. 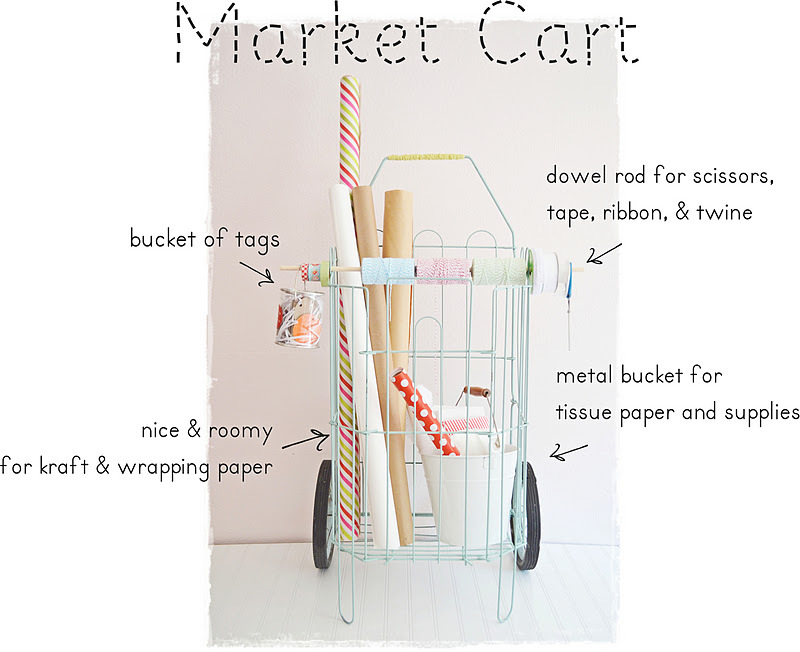 I absolutely love my little portable wrapping cart and it has a nice little home in my craft room! Obviously, not everyone has a wheeled market cart. So I came up with a more attainable idea. This basket is from IKEA and is actually one of the powder coated steel basket drawers. 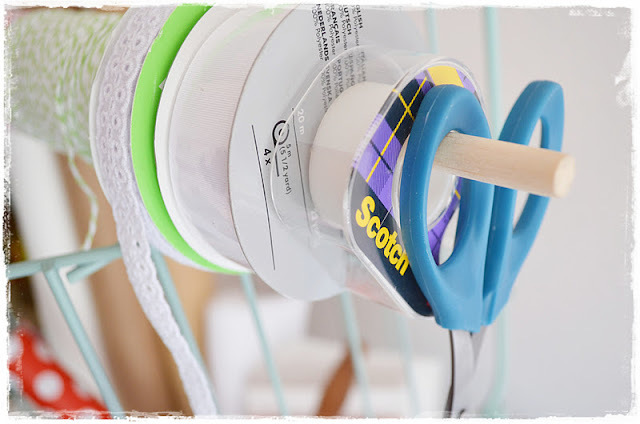 But you can buy them separately and use one of these as a nice wrapping caddy to stow under a bed or at the bottom of a closet until you need it. Just thread your trusty dowel through the holes to keep your ribbon and twine handy and all your other essentials are at arms reach. And with the basket being shallow, you can see everything at a glance. Simple is sometimes best. 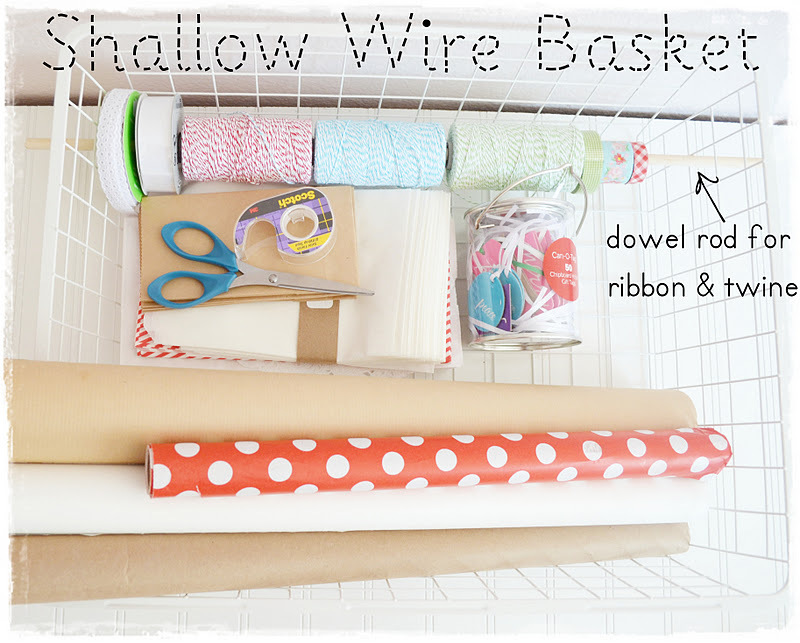 Just pile your wrapping gear in an inexpensive white wire waste basket and you are all set! Use a dowel standing up on end for your ribbon and twine. 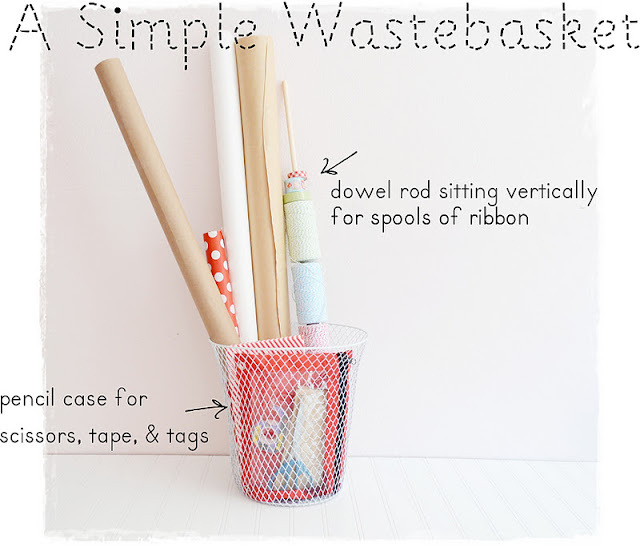 Throw in a little pencil case with scissors, tape, and some tags. There you go! Simple and perfect to stow in the corner out of the way. 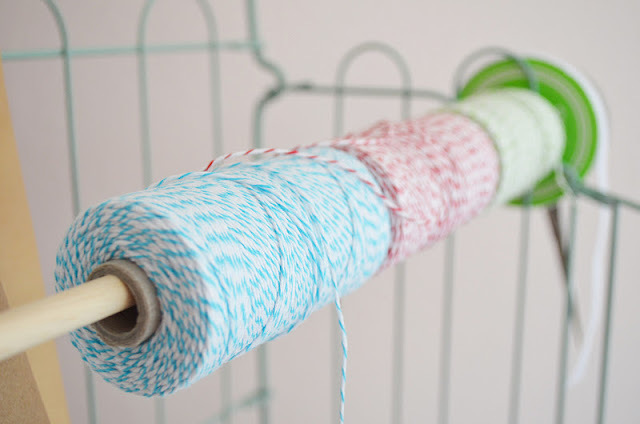 Now that we have ideas to get organized, I will be back tomorrow or the next with some pretty packaging ideas. I can't WAIT to share them with you! I can't promise to post every day. But I promise to share as many ideas as I can with you. This is going to be fun...I just know it! This is awesome! I have no gift wrapping station & my supplies are always strung out all over the house! I love this idea! absolutely genius - perfect- adorable ! i will feature it on my french blog tomorrow ! 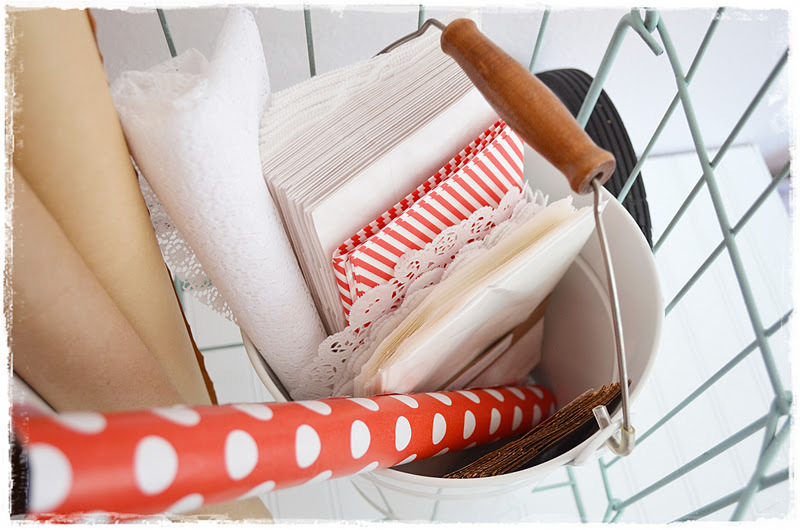 Oh I love it-it would be wonderful to have such basket to hold what I need to make gifts ready. I excited to see the rest of your ideas! I love how bright you photos are too! Such a great idea...love it! I'm your newest follower stopping by from the 36th Ave. blog party. 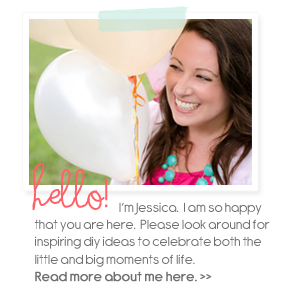 I hope you'll get a chance to stop by my blog & follow along too! Absolutely cute, great, sweeeet, love it!!!!!!!!! Something I can do! I have one of those shopping baskets... where did you get the multi colored string? Love that! If I ever get better, I will have to do this, after everything else piled up! This is the best idea! I love how organized it is, I'm for sure going to try and copy cat you! This is brilliant! Thank you for sharing! So I am not sure if I should admit this but I peeked at this yesterday & didn't have time to comment & guess what you had me buying today! GIFT WRAP! I am soooo a wait until after Thanksgiving (at least I pretend to be) & There I was November THIRD buying wrapping paper. Now if only I could actually make a wrapping station that wouldn't become a "sword headquarters." Some year.... :) Thanks for the inspiration!!! LOVE this!! So creative...thanks for sharing! I love your portable gift wrap station. Absolutely darling. you know you're going to be hired on to Martha Stewart's team, right! you are too clever!! and I love you bunches!! I love this, it's so handy and so cute!! You are very creative! 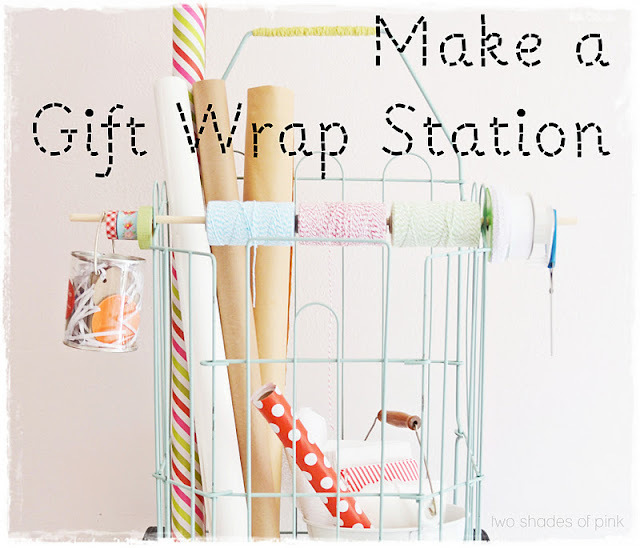 The Market Cart Gift Wrap station is just what I need! Do you think the cart is big enough to store gift bags in also? I really need to find me a cart soon. I'd love for you to stop by my blog and say hello if you get a minute. I love this!! I have been browsing around your blog for a few HOURS now. lol So cute! Your newest follower, and I can't wait to see what you will do next! I love (and want) that market cart!! What a creative use for it!! And the others as well!! Ok so I pinned it and am making it a feature from last weeks party!! And I'm your newest follower!! Yay! i have a little blog where i just spotlight all the creativity out there and would love to direct people to this tutorial this week. i was wondering if it would be ok if i used your top picture from this post. you can check out my blog at www.dandelionfarmgirl.com and make sure i'm legit if you want. ;D if you could let me know by monday night that would be fabulous. Best idea I could find on the internet! This station will accomodate the supplies of ALL shapes and sizes, which otherwise is impossible to achieve. I don't want to buy wrapping paper that fits my organizer, but instead want to organize all my favorite wrapping paper. 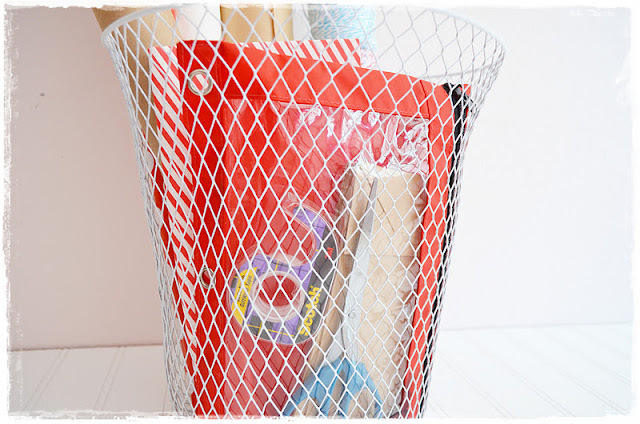 I came upon your blog as I was browsing the net, looking for a much cheaper alternative to the Elfa organizer. These were some awesome ideas, and I thank you so much for sharing! super cute idea..love the re-purpose creations. Great photo's too!! I am continuously browsing online for tips that may assist me. thing that is needed on the internet, somebody with somewhat originality.